3 Inch Comp-Cut Rear Weld-On DeFender Flares 094 (Steel) for Jeep Wrangler YJ 1987-1996. These Comp-Cut DeFender Flares are designed to match Poison Spyders front DeFenders with 3 inch Flare. They are intended to be welded on to your existing Poison Spyder Comp-Cut Crusher Corners or other manufacturers or DIY comp-cut corners. Note that we offer two different styles of Comp-Cut DeFender Flares. Consult the product information below to determine which works best for your application. DeFender Flares are designed to match Poison Spyders front DeFenders. These weld-on DeFender Flares may be added to your existing Poison Spyder Crusher Corners or competitors Full corner armor. Fabricated entirely of 3/16 inch plate steel, DeFender Flares are a tubeless design, meaning they arent constructed with the thinner wall (.120) tubing outer rail, as traditional tube fenders and flares are built. DeFender Flares feature a sturdy outer edge formed of 3/16 inch plate, with a Full under-side return for strength. Comp Cut DeFender Flares are intended to be added to Comp-Cut style Poison Spyder Crusher Corners or other manufacturers or DIY comp-cut corners. They are open at the rear, to accomodate the open rear styling of comp-cut corners and provide for stretched wheelbases and un-restricted tire access to obstacles at the rear corners of the Jeep. Please Note: There are Two different styles of Comp-Cut DeFender Flares, which we refer to as 093 and 094. Style 093 was designed for use with corners that were cut to be used in conjunction with wheel well to wheel well (or WW2WW) Rocker Knockers or other manufacturers WW2WW rocker protectors. The forward, lower portion of the flare does Not extend as low, so that it will stay completely on the shorter-cut WW2WW corner. 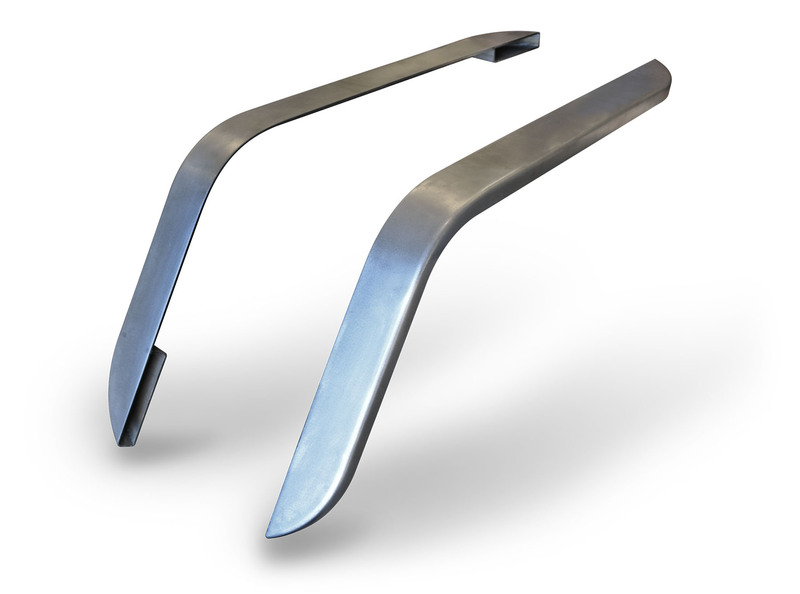 Style 094 was designed for use with Poison Spyders Standard Comp-Cut Crusher Corners or other manufacturers comp-cut crusher corners that extend to the bottom of the rocker at the forward edge. In other words, for corners that were designed to fit with flare to flare Rocker Knockers or other manufacturers flare-to-flare rocker protectors. On the 094s, the forward lower part of the flare extends downward for more complete coverage on those style corners. DeFender Flares are also available already welded to Poison Spyder Crusher Corners. This product ships as bare steel it will need to be painted or powdercoated prior to final installation. We do Not offer a powdercoat option for this item.